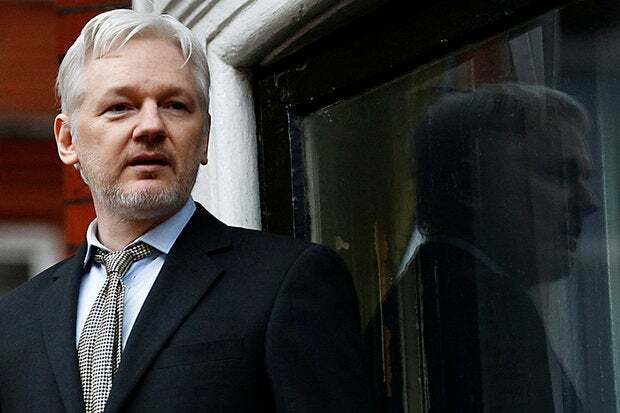 WikiLeaks founder Julian Assange said Facebook is the "most appalling spy machine" ever invented. Users are creating the "world's most comprehensive database" for U.S. Intelligence. During the worldwide online celebration, did you post on Facebook or tweet the happy fact that Osama Bin Laden is dead? So many people "liked" an "Osama bin Laden is Dead" page on Facebook that it went viral. But according to WikiLeaks founder Julian Assange, "Facebook in particular is the most appalling spy machine that has ever been invented." While talking to Russia Today about recent revolutions in the Middle East and the role of social media, Assange explained that Facebook is "the world's most comprehensive database about people, their relationships, their names, their addresses, their locations, their communications with each other, and their relatives, all sitting within the United States, all accessible to U.S. Intelligence." In the interesting interview, Assange added that it's not just Facebook, but Google and Yahoo as well as all other major U.S. organizations have developed built-in interfaces for U.S. Intelligence. It helps get around the costly and time-consuming serving of subpoenas. Not that Facebook is run by U.S. Intelligence agencies, but instead of handing out records "one by one," it saves Facebook time and money to have "automated the process" for spying. Assange believes that all Facebook users should understand that by adding friends, it connects the dots, builds the databases, and does "free work for United States intelligence agencies." The EFF previously warned that Big Brother wants to be your friend for social media surveillance. It's no surprise that U.S. Intelligence trawls millions of websites, Twitter feeds, YouTube, and blog posts, looking for connections between people, groups, and events. That job must surely be a madhouse right now. To sort through the sea of online chatter, the DoD and U.S. Intelligence allegedly use real time search, data mining, and predictive analytics provided by Psydex. Google Ventures and In-Q-Tel, the investment arm of the CIA, both provided funding for the company Recorded Future which offers a Temporal Analytics Engine for predictive analysis, allowing people to "visualize the future, past, or present." Big Brother using link or predictive analysis is not new. Nor is the question of how online companies work with Intelligence. Consumer Watchdog had even questioned the relationship of Google and NSA. All intelligence agencies data mine social media. But right now, the military may not need to use its army of fake social media puppets to spread propaganda online. Just as Bin Laden's death was a needed psychological victory for most Americans, hopefully the masses cheering the death of Bin Laden will be a huge psychological blow to terrorist networks. U.S. Secretary of State Hillary Clinton said, "Our message to the Taliban remains the same, but today, it may have even greater resonance. You cannot wait us out. You cannot defeat us, but you can make the choice to abandon al Qaeda and participate in a peaceful, political process." There may be lots to talk about in Assange's revelations of built-in online surveillance, just as we could look at how SEAL Team 6 used facial recognition devices to identify the terrorists, but right or wrong, I'm too happy today. Last night, there wasn't much sleep for many of us, but there was an incredible swell of American pride during cheers and chants of "USA! USA! USA!" Just be wise about what you do or say online as it's one giant tool for surveillance by U.S. Intelligence. In the same token, who knows what We the People might see? As Business Insider pointed out, it's doubtful the U.S. will release the video that President Obama watched live of the Bin Laden raid, "but in this age of Wikileaks, anything's possible." Special thanks to heroes of U.S. Navy SEAL Team 6. That Boom, head shot, was literally a "Monster Kill" heard around the world. TSA Surveillance: Peep Show, Police State, Privacy Invasion or All Three? What dates did your mom receive pre-natal care? Don't know? Passport denied! Will Google's legal woes define how far it crossed the creepy line?